This well-balanced composition of gemstones is the perfect blend to start your gem water collection. 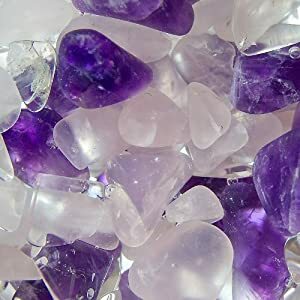 Amethyst, a protective stone, is linked to the crown chakra; ideal for meditation; helpful in purifying the mind and clearing negative thoughts, stress and anxiety. Rose Quartz, also known as the heart stone, dissolves emotional wounds, fears and resentments by nurturing the wounded heart with unconditional love. Clear Quartz is the most powerful healing stone of the mineral kingdom for those seeking clarity of mind. This naturally healing mixture of quartz crystals promotes calm, revitalizes your tired mind, and allows energy to flow smoothly throughout the body. Expertly designed lid holds Gemstone Vial firmly in place while seemingly floating freely. The lid does not need to be taken off while pouring water, creating a beautiful effect while serving. Handcrafted vial contains semi-precious, tumbled gemstones. The Gemstone Vials are hand-crafted as well, please carefully hand wash.
All of our products are shipped by Amazon and Prime Eligible.